Whipped Cream Sundaes … A Generous Portion of Catering Quality Ice Cream and Delicious Toppings, Garnished with Whipped Cream and a Cherry. In Assorted Flavors. Old-Fashioned Banana Split … Vanilla and Chocolate Ice Cream and Banana with Pineapple, Strawberry,and Chocolate Topping, Whipped Cream and a Cherry. One Egg, any Style … With Two Sausage Links or Bacon Strips, Toast,Butter and Jelly. Two Pancakes … With Two Sausage Links or Bacon Strips, Butter and Syrup. Two Pancakes … Topped wth One Egg, any style, Butter and Syrup. Extra Thick French Toast … With Two Sausage Links or Bacon Strips, Butter and Syrup. Chocolate Chip Pancakes … With Two Sausage Links or Bacon Strips, Butter and Syrup. Served with Small Milk or Small Chocolate Milk or Small Orange Juice. Specials Served with a Choice of Soup, or Salad, or Small Juice, Choice of Potato or Vegetable, Bread Basket and Dessert. Includes Homemade Soup or Salad with Choice of Dressing, Rolls and Butter, with Choice of Ice Cream, Pudding, or Jello. Chicken or Steak Fajitas … Your Choice sauteed with Green Peppers and Onions. Served with Tortillas & Garnish. Quesadillas … Large Flour Tortilla with Melted Cheese and Your Choice of Chicken or Steak. Super Burrito … Our Large Tortilla Stuffed with Chicken or Steak, Lettuce, Tomatoes, Cheese, and Side of Beans. Jumbo Gulf Shrimp … Served with Cocktail Sauce and Lemon Wedges. Fried Boneless Lake Perch … Served with Tarter Sauce and Lemon Wedges. Fried Shrimp (21) in a Basket … Served with Cocktail Sauce and Lemon Wedges. Served with Homemade Soup or Tossed Diner Salad or Cottage Cheese or Rice, and Choice of Ice Cream, Pudding, or Jello. Veal Parmigiana & Spaghetti … Special Tomato Sauce and Parmesan Cheese. Chicken Parmigiana & Spaghetti … Special Tomato Sauce and Parmesan Cheese. Spaghetti Italiano … Special Tomato Sauce, Parmesan Cheese, and Meatballs. Mostaccioli … With Tomato Sauce and Meatballs. Grecian Parmigiana & Spaghetti … With Gyros Meat, Topped with Mozzarella Cheese and Special Tomato Sauce. Includes Homemade Soup or Salad with Choice of Dressing, Rolls and Butter, with Choice of Ice Cream, Pudding or Jello. Grecian Chicken Breast & Spinach Pie …Served with Rice Pilaf. One Grecian Pork Chop & Spinach Pie … Served with Rice Pilaf. Sliced Gyros & Spinach Pie … Served with Rice Pilaf. Grecian Specials are served with Soup or Salad, Choice of Potato or Rice, Rolls, and Butter with Choice of Ice Cream, Pudding or Jello. U.S.D.A. Choice cut N.Y. Strip Steak 8oz. … With Onion Rings and Au Jus. U.S.D.A. Choice Chopped Steak … Smothered with Grilled Onions. Broiled Center-Cut Pork Chops … Served with Applesauce. Served with Homemade Soup or tossed Dinner Salad or Cottage Cheese or Rice, and Choice of Ice Cream, Pudding, or Jello. Roasted Turkey … Dressing, Turkey Gravy and Cranberry Sauce. Country-Style Veal Cutlet … With Brown Gravy. Iron-Rich Baby Beef Liver … With Your Choice of Onions or Bacon. Barbeque Baby Back Ribs … Full Slab or Half Slab … Lean and Meaty with Our Own Special Sauce. With Our Dinner Selections, We Serve Homemade Soup, or Salad with Choice of Dressing, or Cottage Cheese, or Rice, and Bread Basket and Butter. Lo-Calorie Special … Half-Pound Boiled Chopped Choice Steak, Cottage Cheese, Hard-Boiled Egg, Sliced Tomato, Cucumbers, and Fresh Fruit Garnish. Weight Watchers … Our Choice Cut 8oz Broiled Sirloin Steak, Cottage Cheese, Hard-Boiled Egg, Sliced Tomato, Cucumbers, and Fresh Fruit Garnish. Grilled Breast of Chicken … With Cottage Cheese Sliced Tomato, Hard-Boiled Egg, and Fresh Fruit Garnish. Stuffed Tomato … With Choice of Chicken or tuna Salad. Served with Cottage Cheese, Hard-Boiled Egg, and Fresh Fruit Garnish. 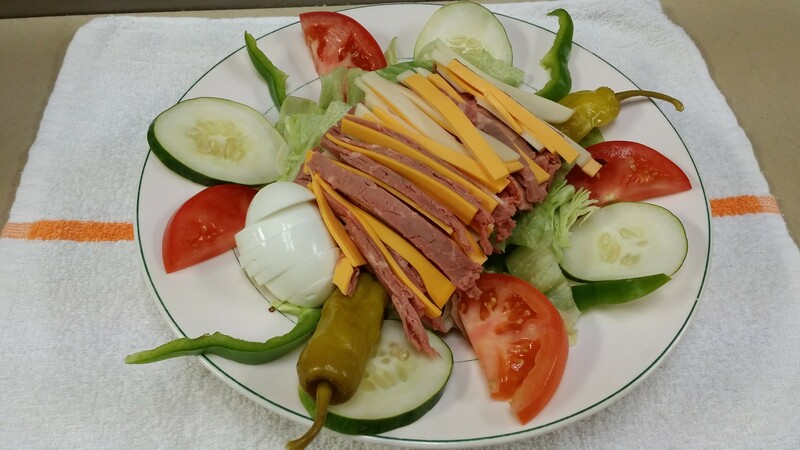 Olde York Salad … U.S.D.A. Choice Sliced Sirloin of Beef Swiss and American Cheese, Sliced Cucumbers, Wedges of Tomato, Hard-Boiled Egg, Olives, Green Pepper Strips, and Onions over Mixed Greens with Your Choice of Dressing. Phoenix Julienne Salad … Small or Large …Cold Crisp Mixed Greens topped with Your Favorite Dressing. Topped with Ham, Turkey, American and Swiss Cheeses. Garnished with Tomato and Hard-Boiled Egg. Trim & Slim … Sliced Breast of Turkey served on a Bed of Lettuce with Cottage Cheese, Sliced Tomato, Hard-Boiled Egg, and Fresh Fruit. Fresh Fruit Plate … (In Season) With Cottage Cheese or Sherbet and Raisin Toast. Taco Salad … Our Crisp Tortilla Shell filled with Garden Greens and Seasoned Ground beef over a Bed of Crisp Lettuce, Topped with Shredded Cheese, Diced Tomatoes, and Black Olives. Served with Salsa and Sour Cream on the side. Wedges topped with Anchovies, Greek Feta Cheese, and Oregano. Served with Our Special Grecian Dressing. Caesar Salad … Romaine Lettuce, Croutons, Cucumbers, and Hard-Boiled Egg with Caesar Dressing. Cottage Cheese and Peaches … with Sliced Peaches and Raisin Toast. Tossed Salad … Served with Choice o Dressing, Bread Basket, Roll, and Butter. Tasty Cheese Fries … Golden French Fries Covered with Nacho Cheese & Jalapeno Peppers. Mozzarella Cheese Sticks (8) … Served with Marinara Sauce. Chicken Strips (5) … Served with Barbeque Sauce. Potato Skins (6) … Served with Melted Cheddar Cheese, Bacon & Sour Cream. Jalapeno Poppers (6) … Stuffed with Cream Cheese. Breaded Mushrooms … Served with Ranch Dressing. Combo Platter … Mushrooms, Onion Rings & Mozzarella Sticks. Cold, Sliced Roast Beef Served on Toast. Sliced Breast of Turkey Served on Toast. Tuna Salad Served on Toast. Denver Sandwich Served on Toast. Fried Egg with Bacon or Ham. Chicken Salad Served on Toast. Bacon, Lettuce, & Tomato Served on Toast. Fish Burger Served on a Toasted Bun with Tarter Sauce. 8 oz. New York Strip Steak … Served on French Bread with Sauteed Green Peppers, Onions and Mushrooms. Pork Chop Sandwich … Served on French Bread. Our Steak and Chop Sandwiches are Broiled to Order. Served with Complimentary Cup of Soup, French Fries or Cottage Cheese, and topped with Lettuce, Tomato, ad Pickle. Ace of Clubs … Sliced Turkey Breast & Crisp Bacon. B.L.T. Club … An All American Classic! Served with Lettuce, Tomato, Mayonnaise, French Fries, Complimentary Cup of Homemade Soup, Coleslaw and Pickle. Italian … Thinly Sliced Roast Beef Covered with Bubbly Mozzarella Cheese. American … Turkey, Bacon, American Cheese with Lettuce and Tomato. Swiss … Sliced Ham, Turkey, American and Swiss Cheeses with Lettuce, Tomato,and Mayonnaise. Grecian … Tender Slices of Delicious Gyros Layered with Raw Onions, Tomato, & Our Special Cucumber Sauce. French … Tender Corned Beef with Tasty Swiss Cheese. Served on Light Flaky Buttery Croissants, with Complimentary Cup of Soup, French Fries & Fresh Fruit Garnish. With Croissant Sandwiches, You May Substitute Cottage Cheese for Fries. Hot Roast Beef with Brown Gravy. Hot Turkey with Chicken Gravy and Cranberry Sauce. Hot Roast Pork with Brown Gravy. Hot Veal Cutlet with Brown Gravy. Served with Mashed Potatoes, Gravy, and Complimentary Cup of Homemade Soup. Chicken Cordon Bleu … Topped with Sliced Ham and Melted Mozzarella Cheese. Wisconsin Chicken Breast … Topped with Bacon Strips and Melted American Cheese. Monterey Jack Chicken Breast … Topped with Bacon Strips and Melted Monterey Jack Cheese. Alpine Chicken Breast … Topped with Sauteed Mushrooms, Bacon Strips and Melted Swiss Cheese. Cajun Chicken Breast … Prepared with Cajun Seasonings, Green Peppers and Onions. Philly Wrap … Broiled Chicken Breast,Sauteed Onions, Green Peppers, and Mushrooms in a Warm Tortilla. Served with Sour Cream. Clubhouse Wrap … Sliced Turkey Breast, Crisp Bacon Strips, Greens, Tomato, Mayonnaise and Monterey Jack Cheese wrapped in a Warm Tortilla. Mediterranean Wrap … Fresh Lettuce, Tomato, Onions, Grilled Chicken Breast, Feta Cheese and Our Special Grecian Dressing Wrapped in a Warm Tortilla. Phoenix Wrap … Delicious Broiled Steak, Sauteed Onions, Mushrooms, Tomatoes and Monterey Jack Cheese wrapped in a Warm Tortilla. Santa Fe Wrap … Crunchy Golden Breaded Chicken Strips, Lettuce, Tomatoes and Shredded Cheddar Cheese wrapped in a Warm Tortilla. Served with Ranch Dressing. Our Satisfying tortilla Wraps are served with Fries and Complimentary Cup of Soup. Patty Melt … Topped with Grilled Onions. Roast Beef Melt … Tender slices of U.S.D.A. Choice Roast Beef filled with Tomato, Onions, and Melted Swiss Cheese on Pita Bread. Served with Spanish Sauce. Served on Grilled Rye Bread with Melted American Cheese. Hot Melts with Fries served with complimentary Cup of Homemade Soup. 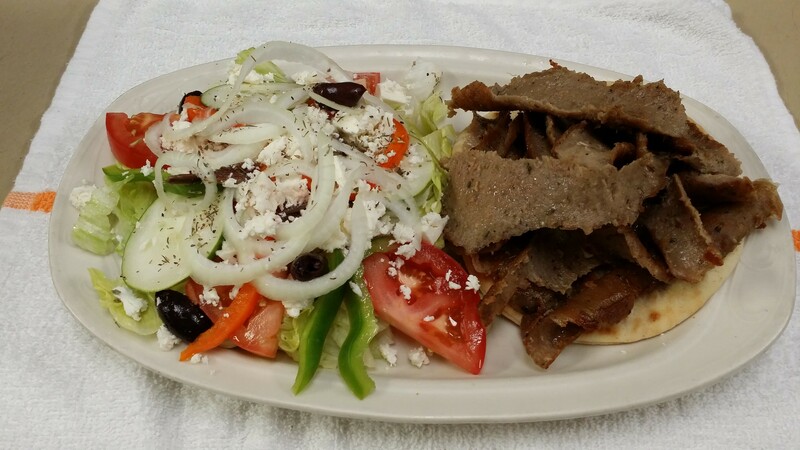 Gyros Plate … Served with Small Greek Salad, Cup of Soup and Our Own Special Cucumber Sauce. Deluxe Gyros Sandwich … Served with French Fries, Pickle,and Our Own Special Cucumber Sauce with a Cup of Soup. Gyros Sandwich with Chips … Served with a Cup of Soup. Side order of Gyros Meat … With Onions and Tomato. A Delicious Continental Specialty! 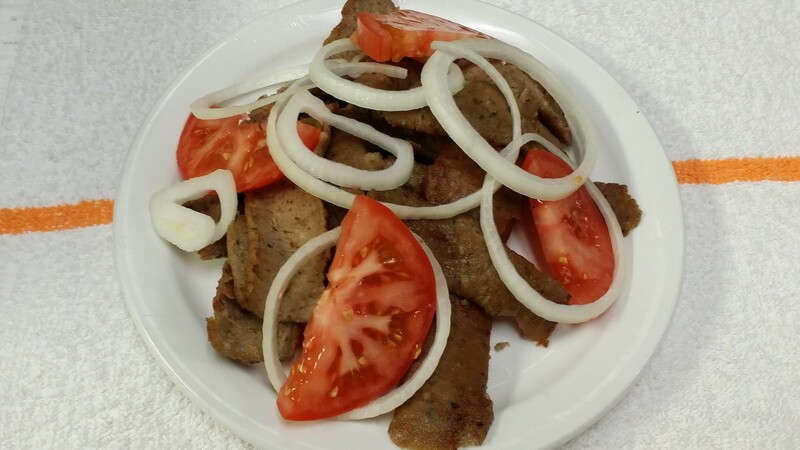 Gyro is a Lean blend of specially selected portions of beef and lamb. It is lightly seasoned and cooked to sear the outside so that the juice and flavor are sealed inside. The meat is cooked to order in the AUTODONER, which gives it the charcoal-like flavor. Served on nutritious Pita Bread. French Dip … Tender Slices of choice U.S.D.A. Roast Beef on French Bread with Au Jus. Monte Carlo … Our Egg-rich French Toast topped with Ham and Swiss Cheese, Grilled to Golden Perfection. Philly Steak or Chicken … Smothered with Mozzarella Cheese & Sauteed Onions, Green Peppers & Mushrooms. Reuben … Corned Beef on Rye with Sauerkraut, 1000 Island Dressing, and Melted Swiss Cheese. Corned Beef … Stacked High on Rye Bread. Fish & Chips … Three Golden Cod Filets with Tarter Sauce, French Fries, Coleslaw, and a Cup of Soup. Bacon Cheeseburger with Melted Cheese ad Two Slices of Bacon. Alpine Burger … Topped with Mushrooms, Bacon Slices, and Melted Swiss Cheese. Pizza Burger with Marinara Sauce and Mozzarella Cheese. Our Delicious Burgers are Char-Broiled Pure Beef Burgers. Served with Chef’s Garnish. Burgers with Fries served with Complimentary Cup of Soup. Pigs in a Blanket…Sausage Links Wrapped in Pancakes. Extra Thick French Toast…served with Maple Syrup and Whipped Butter. Extra Thick French Toast With Strawberries, or Blueberries, or Apples, or Cherries, topped with Whipped Cream. Kijafa Cherry Crepes…Filled with Montmorency Cherries, Poached in Danish Imported Wine. Delicate Crepes Suzette…Fresh Pancakes with Strawberries and Cointreau Suzette Topping. Golden Brown Belgian Waffle with Strawberries, or Blueberries, or Bananas, or Cherries topped with Whipped Cream. The Phoenix Skillet…Hash Brown Potatoes, Corned Beef Hash, Onions, Green Peppers, and Melted Cheddar Cheese topped with Two Eggs, Any Style. Greek Skillet…Hash Brown Potatoes, Gyro Meat, Onions, Tomatoes, and Melted Feta Cheese topped with Two Eggs, any style. American Skillet…Hash Brown Potatoes, Bacon, Sausage, Onions, Green Peppers,and Cheddar Cheese topped with Two Eggs, Any Style. Wisconsin Cheese Skillet…Hash Brown Potatoes, Onions, Swiss, American and Cheddar Cheeses topped with Two Eggs, Any Style. Vegetarian Skillet…Hash Brown Potatoes, Broccoli, Onions, Mushrooms, and Green Peppers with Cheddar Cheese topped with Two Eggs, Any Style. Ole’ Skillet…Hash Brown Potatoes, Chorizo Sausage, Tomatoes, Onions, Jalapeno Slices and Cheddar Cheese topped with Two Eggs, Any Style. Two Fresh Eggs Any Style with Two Slices of French Toast…served with Two Strips of Bacon or Two Sausage Links, Maple Syrup, & Whipped Butter. Two Fresh Eggs Any Style with Two Pancakes…served with Two Strips of Bacon or Two Sausage Links, Maple Syrup & Whipped Butter. Pancake Sandwich … Delicious Slice of Ham between Two Golden Pancakes, Topped with Two Eggs, any Style. Minced Ham & Two Scrambled Eggs…with Hash Browns, Toast, Butter, and Jelly. Pork Patty Sausage & Two Eggs Any Style..with Hash Browns, Toast, Butter, and Jelly. Chef’s Special Eggs Benedict…Two Poached Eggs, and Canadian Bacon on a Toasted English Muffin with Hollandaise Sauce. Served with Golden Hash Browns. Homemade Corned Beef Hash & Eggs…with Golden Hash Browns, Two Eggs, any style, Toast, Butter, and Jelly. Denver Omelette with Ham, green Peppers, and Onions. Cheese Omelette with Choice of Swiss. or American, or Cheddar, or Monterey Jack Cheese. Western Omelette … Filled with Tomatoes, Onions, Ham, Green Peppers, and Melted American Cheese. Spartan Omelette with Onions, Tomatoes, Spinach, & Feta Cheese. Popeye Omelette … Filled with Spinach, Bacon, and Feta Cheese. Vegetarian Omelette with Broccoli, Onions, and Mushrooms. Hawaii Five-O Omelette with Pineapple, Bacon, Ham, & Monterey Jack Cheese. Broccoli & Cheese Omelette with Melted American Cheese. Omelettes are made with Three Country Fresh Eggs Cooked in Butter, with Hash Browns, Toast, Butter, & Jelly. All egg orders are served with: Hash Browns, Toast, Butter, and Jelly. Egg dishes could also be made with Egg Beaters upon request with an additional charge.